Packgoats get out of shape just like we do. Mine spend the winter in the barn being lazy while me and my dog, Banjo, are out chasing ducks and geese. It’s spring now and time for all of us to get back in shape, so I decided to check out the Elk Mountain trail, off Hwy 6 on the way to the Oregon coast. Saturday morning, me and my friends, John, Gary, and John’s dog, Cooper, hit the trail at 6am with Banjo and scrambled our way up the mountain. If you do manage to escape the parking lot and get the goats headed up the trail, your next worry is meeting dogs on the trail. In this goat rodeo scenario, an unleashed dog comes running comes running up to inspect all things goat. The goats turn tail and sprint in all directions (usually back down the trail), then quickly turn and sprint back toward you (the alpha “goat” protector guy), mowing you over in the process. If the trail is narrow with a cliff on one side, you fall over the edge and die one of those gruesome man-meets-rock deaths (sort of like those animated death scenes on the Axe Men tv show). Scenario three: you’re hiking along the trail and meet some really nice, normal people without dogs. Doesn’t matter though: the goats don’t know them, so the goats automatically assume the people are weird and evil. The goats won’t take another step up the trail as long as the people are standing there. Most people who have never been around pack animals don’t realize that there’s such a thing as pack animal etiquette and right-of-way on the trail. It’s a simple rule: the biggest four-legged animal has the right-of-way and everyone else needs to get off the trail on the downhill side about 30 yards (not feet, not inches, yards) if you’re still viewable from the trail (and less if you can get out of sight). It’s harder for large animals to get off the trail, so the smaller ones have to move. And they need to move quickly before all hell breaks loose. Typically when I meet people on the trail, they’ve never seen packgoats before, so naturally they want to chit chat and take pictures, while the goats get more nervous by the minute. Finally, one of the goats will reach his limit and he’ll charge uphill and try to flank the hiker at a safe distance while running full speed through the brush, losing his panniers, and smashing his wooden crossbuck saddle to bits as it gets caught on low-hanging tree limbs. The last time I hiked the goats off of Mt. Hood, the day ended with three out of four saddles smashed and I had a lot more gray hair. Not fun. So I try to scout the trails first before ever taking a goat there. If you start young enough, the goats can be acclimated to these types of scenarios, but my goats are full grown and at this point, it’s just something I have to live with. 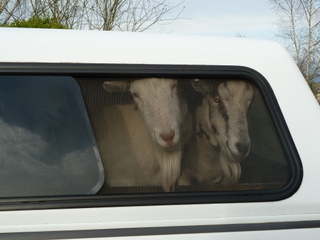 So, last Saturday, I avoided the drama and left the goats at home. It was a good thing I did too. 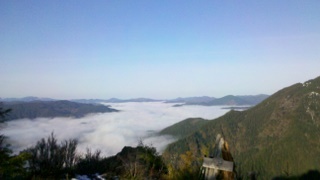 The Elk Mountain trail is narrow, steep, and has high drop-off cliffs. It’s not the kind of place I want to experience the sort of “adventures” noted above. For humans and dogs, it’s great and we had a great time. 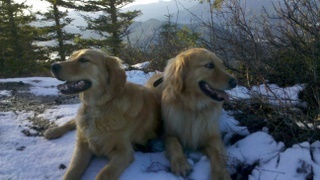 Banjo and Cooper had fun playing together on the trail and the view from the summit was terrific. Had I taken goats along, it could have easily turned out badly for everyone on the trail that day and I’m glad it didn’t come to that. This entry was posted in Hunting, Packgoats and tagged dogs, elk mountain, goat, goathunter, golden retriever, hiking, hunting, outdoor, training. Bookmark the permalink. ← Are You The Alpha In The Herd? Awesome cousin!!! Your writing is very entertaining, and I would love to get to know the goats….